Investment income or commonly known as return on investment have wide variations across different investment vehicles. Investment is placement of money or capital with the expectation of deriving income or profit from its use. capital to participate in the business of others. The former can be a single proprietorship, partnership or a corporation. The latter involves investment in stocks or bonds. Accumulated savings can be used for investment purposes. Some people treat saving and investment as one and the same thing. Compared to how investment was earlier defined, the purpose of savings is basically for safekeeping for later use. Savings is more often than not, beaten by inflation. Below is a comparison of average interest rates of different savings and investment vehicles and the corresponding tax rates on interest earnings The information is painstakingly collated by Engr. Jerecho Placido, an Associate Financial Planner and our mentor at IMG's Wealth Academy. 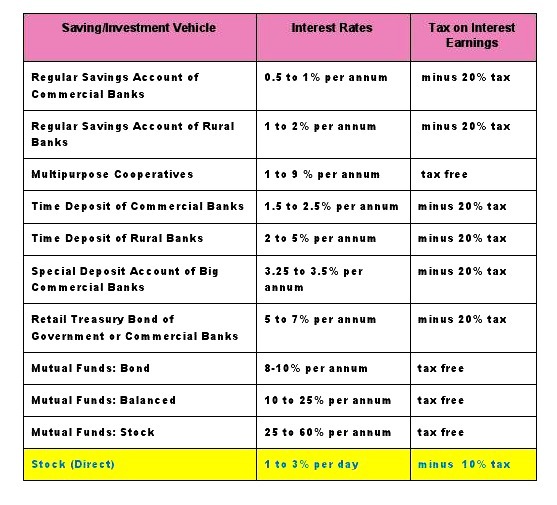 Savings vehicles are included in the table below to emphasize the difference between savings and investment. Now you can see for yourself that direct stock investing yields far more superior investment income than any other investment vehicle. Who can’t be convinced to invest in stocks? I used to be a fan of investing in multi-purpose cooperative because I didn't know anything about stocks and mutual fund investing. As a starter, you can download from the website of Philippine Stock Exchange a primer on Building Wealth with Stocks. While prices of stocks continuously fluctuate, over time it exhibits positive growth. Once you get started, you will have the feel of the stock market mantra, "buy low, sell high." With the ease in online stock investing, there is no reason why you cant directly invest in the Philippine Stock Market. You've got to increase your financial IQ, develop an investor rather than a trader mindset, learn investing by actually doing it. While you are researching and learning investment skills, you can put together what you've learned in a journal which can be a material for a money-making website in the future. Explore this potential source of additional income for retirement.